With the boys over on the left coast either slidin’ sideways on their Dynas or goin’ crazy for anything motorcycle related as long as it was sitting in a barn for a grip of years. Top dollar is expected for anything leakin’ oil and built back in the day, probably by some guy that was three days into a crank bender. Contrastingly, the Dyna, bagger, FXR guys are off doin’ their thing and building rocket ships featuring all the latest technology designed to carry you and your two-foot risers to terminal velocity as spectacularly as possible. 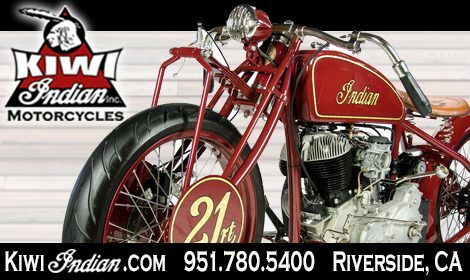 Somewhere between the ‘high tech’ and the ‘incredible barn find’ there is a bunch of great components both factory issued and aftermarket that when assembled properly have the makings of a great sled that’s efficient, powerful, reliable and just badass….and noticeably untrendy. As fate would have it, I happen to have a fine example of just such a bike made with just those parts. The bike that is currently sticking to your eye buds is owned by Jim Gibbons out of Boston Mass and built by Mitch “Magoo” Bodine out of South Jersey. 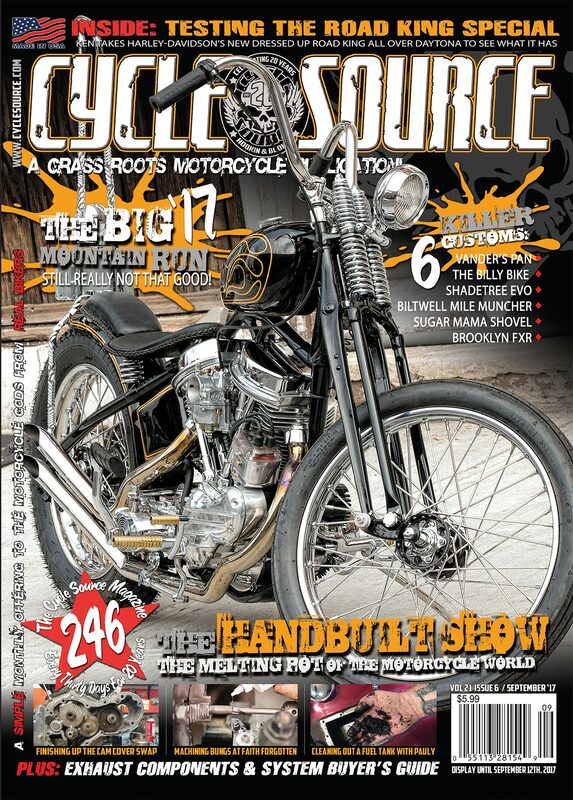 Starting with a titled ’77 fourspeed frame that was sent out to 47 Industries for the hardtail conversion. Mitch wanted to retain the performance and profile, so the dimensions were left relatively stock aside from the hardtail. Keeping with the stock dimensions a set of 39mm HD legs bound together with a set of triple trees from Bill over at Bling’s. A set of simple Biltwell bars run factory HD handlebar controls while Harley-Davidson forward controls were adapted using Fab Kevin hardware. A set of 18” of Sun Rims and a set of stainless Buchanan wrap a set of HD hubs front and rear. Rolling a set of Metzler Sahara tires used front and rear so you don’t have to worry about whatever trouble you might get yourself into. Not being constrained to build a bike to fit in any category Mitch was given the liberty to use whatever brake components he felt would work the best. Running a 10” HD rotor in the rear a Fabulous Kevin rear caliper bracket was incorporated to run the ZX-10 caliper. Up front, a HD 11” rotor is squeezed by a GSXR caliper hung by a Speed Merchant bracket. Initially, Mitch had a Delcron cased slabside Shovel that was built by someone that spent a lot of money on go-fast parts. Unfortunately, just because your credit card was approved does not mean you know how to build a motor. The valves interfered with the pistons and was found to be unusable and shelved. 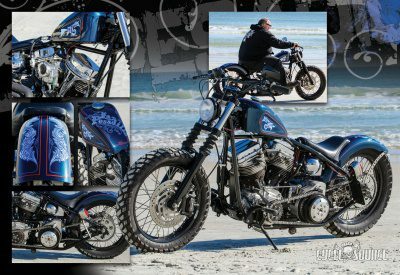 Luckily, one of Mitch’s buddies had this STD built Shovelhead sitting around forever, and a deal was struck, and the motor ended up powering this ride. The motor was originally built at STD years ago and is built with all the good stuff. It’s a cone configuration with Truett and Osborn crank assembly stroked to 88” using Wiseco forged pistons in S&S cylinders and topped with a set of STD dual plugged Panheads. Feeding the fuel is a tried and true S&S Super E carb, and Andrews “B” grind cam and the whole mess gets fired by a Morris Magneto. The oil tank is a Speed King that has been modified to use A/N fittings and end holds the AntiGravity battery. Keep in mind that these lithium batteries can be temperamental if your charging system isn’t on point, so Mitch had one built by Cycle Electric designed explicitly for lithium batteries. There hasn’t been a problem yet. 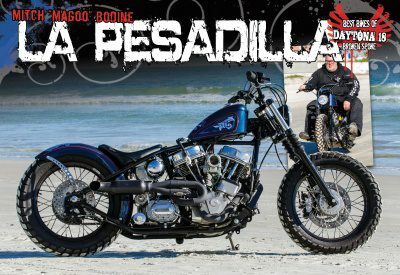 This entry was posted in Feature Bikes and tagged Back Issue, Chopper, custom bikes, Cycle Source, Cycle Source Magazine, Feature bike, Harley, Harley-Davidson, July 2018, La Pesadilla. Bookmark the permalink. ← Paul d’Orleans On ShopTalk Last Night!! !